One half of that newsletter is Dylan Matthews, a correspondent at Vox.com since its founding. He is also on the autism spectrum. Dylan has been a fixture writing about politics for more than decade now, beginning to write blog about politics under the title of minipundit at the age of 14. He eventually wrote for Slate, Salon, the American Prospect and the New Republic before he cut his teeth as at his college newspaper, the Harvard Crimson. He eventually began writing for the Washington Post under Wonkblog, which was run by Ezra Klein. When Klein left the Washington Post to start Vox.com, Matthews joined him and to write about “effective altruism” and to argue provocatively ideas that may not have been considered elsewhere and have riled many on the right. Examples include a piece arguing the United States Senate should be abolished and another that the American Revolution was a mistake. He’s also written about autism, having interviewed Steve Silberman about his book Neurotribes. 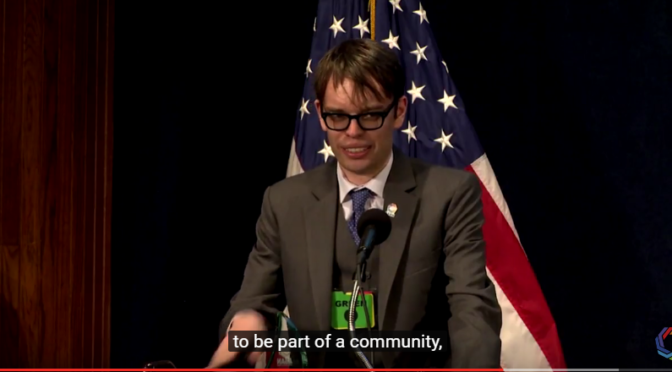 Last November, he was honored by the Autistic Self-Advocacy Network at the organization’s gala with the Harriet McBryde Johnson Award. Dylan and I have gotten to know each other as two of the handful of openly autistic journalists here in D.C. I caught up with him to talk about autism, journalism, the recent honor and Donald Trump. The interview has been edited for clarity. Dylan Matthews: I mean, yeah. I think there’s some of that and I’m not primarily a health reporter which is the group that primarily covers stories like that. I feel like the way to channel that is the things that are most aggravating are the stuff that’s just factually incorrect like there has not been an increase in actually incidences. There has been a change in the diagnostic criteria. And so it is infuriating when people act like this is an accelerated problem. It’s infuriating obviously when people bring up vaccine nonsense, that kind of thing. In terms of how it affects my journalism, I’d like to think insofar as I’m writing different things that I would write if I were neurotypical. It’s mostly having a better exposure to facts and better perspectives just from the input of the community. EG: Yeah. One of the things that makes hard for journalists, since we don’t have that exposure, I think as journalists, when we are learning about something we go to “experts.” When we’re looking up something, we try looking up the biggest autism organization and the biggest organization is Autism Speaks, for better or worse. Or we’re going to talk to professors or we’re going to talk to “advocates” and for however long, it’s been parents who dominate the conversation. So when you’re a journalist, you look up those default experts, so I think it makes it harder. So that poses a challenge to journalists where they sometimes get the misconception from them. DM: And it’s worth reflecting how weird that is that other parts of the disability community have…there’s a greater baked in assumption that the advocates should be the one advocating for something. Like when people hear about Deaf culture and Deaf issues, it’s not through hearing family members at all, which is great. That’s not to say the media covers that perfectly. I am sure we screw up plenty. But I guess we are still fighting against this assumption that the people who care most about this are family members and not actually [autistic people]. EG: I think Vox is a perfect example of this. You guys do consult experts and you guys get the smartest people for your “Big Ideas” section and things like that. What are some ways journalists can find the right, even if it may take more work, not necessarily police sources but find the best ones? DM: I think a lot of this is trial and error and I’ve screwed up at times and sort of relied too heavily on one source or trusted somebody I shouldn’t have or whatever. I don’t mean to be speaking from a point of perfection on this. I think one thing you can do is do a lot more preliminary research before like interviews. Because I think there’s an instinct to go straight to interviews, you do an interview; you get names, as soon as you talk to people. I think there’s something about hearing someone’s voice and talking like one on one with someone that makes you sort of absorb their worldview more easily. And like when I’m approaching something that I don’t really know, I usually try to spend like three or four hours going through what online debates trying to find groups to sort of try to read up as much as I can and get sort of a mental map of sort of what things are consensus; what things are disputed. Sort of perspective into groups and choose my sources from there. The thing I usually do is sort of ask people who someone smart is who disagrees with them is. That’s one of my favorite things to ask people since usually, unless they’re very, very cocky, people will like have people who they consider fair interlocutors from a different vantage point. And so that also sort of helps you weed out flame wars between the two sides that just don’t respect each other at all. It’s helpful for finding sources to whom the other side’s views are intolerable. I’m as skeptical about “both sides” journalism as anybody and I don’t think there are two sides about questions about whether people should be treated with dignity and with fairness and respect. But I think that doing that kind of process, if you are writing about autism, certainly exposes you to self-advocacy and the rights movement and that sort of disability rights conception of autism and that would be a beneficial thing. EG: I’m a little bit late to it but congratulations on the award. DM: Very nice of Julia [Bascom, executive director of the Autistic Self-Advocacy Network]. EG: But that kind of goes to the thing I have been thinking about. Neither you nor I are “disability journalists,” which is to say, you mainly write about policy and economics. I mainly cover politics. In one sense I think that’s a good thing because it shows that autistic people don’t have to be computer programmers and it shows that you don’t get into that journalism ghetto that happens. When I was in college, I didn’t want to write about immigration because I didn’t want to be the Latino reporter. I think it’s cool that you and I don’t cover autism all the time because we’ve written about it but it shows that hey, autistic people can be as good reporters about economics and politics or Congressional races. DM: Yeah and I think a temptation for you that I don’t want to… not wanting to limit but I think there’s also a concern of not wanting to conceive of it as a thing that’s definitive. I know a lot of writers who sort of write on feminism issues and who complain about getting sort of pigeonholed into “you’re a gender writer, you write like firsthand experience stuff” or whatever. And those are people who have like insisted on covering stuff like in the same manner you would cover [cover regulatory issues, or a foreign war]. And in doing that get it normalized to the point where it’s a serious topic to be written about using the vernacular of serious journalism. I think it’s worth thinking about disability policy that way as well. It’s not an asterisk on stuff—it sort of bleeds through. Right now we are having a debate on repealing Obamacare, something will have massive implications for people disabilities. That’s something that’s going to have to come up in this defining debate in the country. EG: Ari Ne’eman [Autistic Self-Advocacy Network’s former executive director] wrote that piece for you guys. DM: He did. Yes. I think you can center these issues in a way doesn’t make it about you. EG: A lot of people, when I mention I’m autistic, we’ve both kind of talked about this in the past, people are like “wait what?” There’s this trope we are antisocial. In some ways, it’s kind of an advantage because you are able to focus myopically on these things. So that, come the interview, you’ve done your homework. DM: I think there’s that, I think there’s an affinity need for research and sort of obsessive need for system-building to a degree to which you sort of have to hack social interactions that because you sort of learned social cues as a second language, you have a better abstract conception of how they work. And so like I know a lot of journalists who I don’t think are diagnosed and I don’t want to identify people without their consent but they get a lot of interesting stuff just by asking questions of politicians and then leaving pauses after they initially answer and I think it might have started because they didn’t know you’re not supposed to do that. But it turns out to be a way that gets people to add more stuff or some things that weren’t planned. Ways in which you bring unique approach to the communication side of things too. EG: What are your hacks? DM: Some of it is just sort of finding the way the way to communicate. So like eye contact was hard for me. DM: So I do a lot more interviews on the phone than in person because it abstracts that way. There is. I do a lot of email interviews with experts where the goal is less to trip someone up and get them to say something revealing than it is get an accurate account of someone’s views. And some of it is just developing forms. I have sort of a stock way that I ask experts and I’ll mix it from time to time to keep it fresh. So I’m not freestyling every time and I think there’s a greater chance in error when you do that or saying something that’s unintentionally uncouth or something. DM: What is an important aspect I haven’t brought up? That’s a favorite question. EG: One of the other things about being autistic is that it allows you to be able to spot BS. EG: You can tell if someone is spatting off talking points. Because we come at looking at social interactions from a point where it’s not natural, I can kind of see where something is forced. DM: Or yeah when it’s shtick. There are times where people are so good at it. I think there’s that and there’s a degree to which where you’re being…the way I like to absorb information by sources is by laying it out into a coherent argument like in my notes. You notice when that works and you notice when that does work and when it’s possible to do it with someone. And that I don’t know what degree that’s a spectrum thing versus another element of personality. That is helpful and it is a good BS-meter. EG: Up until around middle of last year, I would have said the media was getting to a point where it was getting better. Steve Silberman’s book Neurotribes came out. We saw some autistic characters. Then on the other hand, you have still President Elect Donald Trump saying autism is an epidemic and meeting with Andrew Wakefield. Where do you think we are now? We are starting to call out anti-vaccine people as kooks. But where are we now? DM: So I think the media is incredibly good at anti-kookery element of anti-vaxxer-ism. That like you will get jumped on an rightfully so for that. I felt like there’s been a pendulum shift on that. But I was sort of disappointed with the coverage of Trump on this. And we’ll see how this goes when he brings this up again. He’s not just saying stuff that’s wrong. He’s saying like “I would rather risk having a kid get a deadly illness than a kid on the autism spectrum.” And it’s that French saying that “it’s worse than a crime; it’s a blunder.” It’s worse than a falsehood; it’s an offensive falsehood. The logic underlying it is sort of dehumanizing. I wish that that got more attention. It’s not just a factual dispute. It’s a question of values and how you value people. EG: He’s saying “I’d rather have kids have measles than have autism.” And it’s equating measles, with something we want to get rid of completely, with autism, which I know a bunch of people with autism. It’s not a bad thing. DM: It’s like a different way of experiencing the world. That has been sort of disappointing. I was encouraged by Hillary Clinton’s platform on this. Not that I thought it was perfect in every respect, but just that it clearly bore the hallmarks of something that was drafted with the assistance of many self-advocates. EM: Ari Ne’eman worked on it. It had a lot of the language you hear in the Neurodiversity community. DM: Exactly. And there’s no equivalent for Trump because so far as I can tell, none of his policy plans were prepared by consulting a large group of people. But I think that suggested there’s a seat at the table and there didn’t used to be. EM: The fact there was a specific plank about it. You and I wrote about it. Carly Fleischmann had that great interview with Channing Tatum, which she stole the show from him. It was great to see a non-verbal autistic girl steal the show from a movie star. We got lucky and we got breaks. People like Ron Fournier [Atlantic writer whose son Tyler has Asperger’s] with me and Ezra [Klein, Vox’s Editor-In-Chief] with you. What would you be your suggestion for autistic people who want to get into media? DM: I’d say there are some degrees of getting into it that are fortuitous and chance-based and you can’t get to a certain place without it. I totally got lucky meeting Ezra and I’ll never once diminish the role of luck. I’ll also say that while it’s not a sufficient condition, it is a necessary one to work at it a lot and develop a lot of output and develop an ethic of doing it regularly. I wrote a blog everyday basically from when I was 14 until I was 17 or 18. And I did less of that in college and started doing the college journalism stuff and started doing that regularly. Making yourself write 500 words a day makes you a better writer. There are probably some things you get obsesses with or dig into really deeply and if you are already caught up in that, just like write a blog about it. Put something on paper. It doesn’t have to be good. It doesn’t even have to be interesting to anyone who isn’t you. You just have to do it in a consistent manner. And if it’s something you’re passionate about, it shouldn’t be that hard. It’s just motivating yourself to do that should not be a chore. This isn’t a field that you should get into if you are seeking fame or glory. And one thing that is a good test of that if you have a routine of doing that. EG: I have to close this out with the question I mentioned. Is there anything I’m not thinking of? DM: I think that covers that mostly. I’m really excited to see where NOS goes. I think it’s really cool to have an independent editorial voice in this community. Previous PostA Letter from the EditorNext PostCan We All Stop Talking About The ‘Disabled Reporter’ Incident Now?